In his garden in Giverny, Claude Monet experimented with a new way of using colour and pushed the study of nature to the limits of abstraction .His extraordinary freedom of execution, his revolutionary conception of pictorial space and the emotional purity which radiates from the brushstrokes of his last works have inspired numerous artistic movements, such as lyric abstraction, action painting and tachism. Jackson Pollock, Joan Mitchell , Sam Francis, André Masson…..All the great names of modern art have hailed the Master of Giverny as being the precursor of Abstract Art. Kandinsky acknowledged that seeing the « Meules » was a revelation to him. This same series was to also inspire Andy Warhol and Roy Lichtenstein. Since the painter’s death, so many artists have claimed artistic filiation to Monet and have come to Giverny on a pilgrimage , searching the water garden to discover the secret of the light in the « Nymphéas ». For almost 20 years, The Versailles Foundation, Giverny Inc. has financed, every year, the stay, for three months, of two artists. Furnished apartments and a studio are placed at their disposal. This residency is a way to honour the American donors, without whom Giverny would not have become what it is today. The Versailles Foundation, Giverny Inc. offers them the return air ticket , as well as a grant. 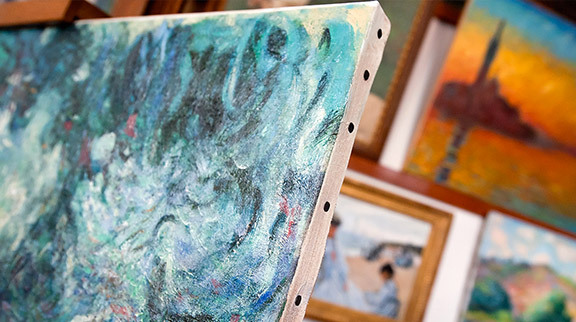 The « Fondation Claude Monet » places accommodation and a studio at their disposal.